Her Highness, the Crown Regent of Fussypants experienced one of life’s “firsts” not too long ago. 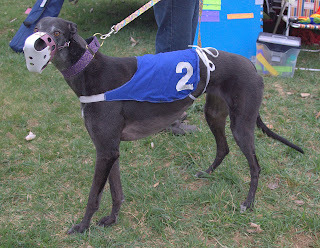 After spending her early years training hard to be a racing greyhound she never got to fulfill that potential. She was sent to a racetrack in Rhode Island but before she got her maiden race under her belt, they up and closed the track on her. For reasons I have been puzzling over (and rejoicing over) since she joined our family, they opted not to ship her to another track. After all that feeding, care and training, they retired her from racing before her career even began. Miss Bettina found herself at the greyhound rescue kennel at the tender age of 18 months. In looking at her pedigree online, I noted that of the puppies in her litter (5) only one ever raced at all. 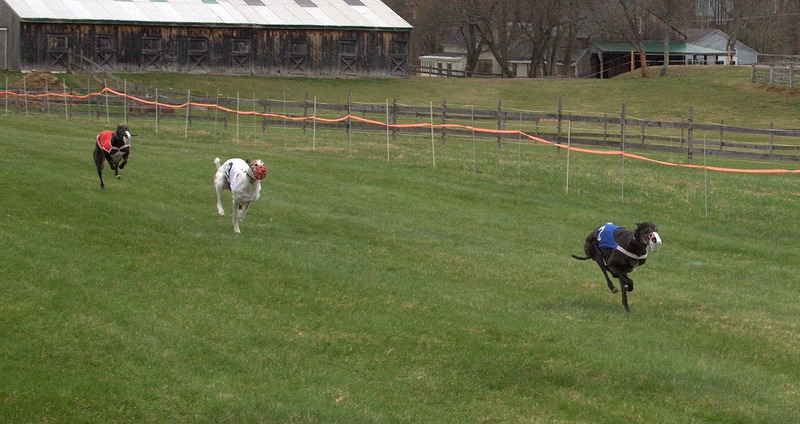 And that one pup had only a couple races under his belt. At various times during our early life together I observed that Bettina had a strange running gait. It also quickly became apparent that she was EXTREMELY stubborn. And, much to Blue’s chagrin, she could be aggressive and frankly a bit of a bully. Any of these things I figured may have been part of the determination to put her out to pasture without a single race. I have never had such a young greyhound on my hands before. She has energy to spare so I began to cast about for some activity that could tap that endless well. Maine, unfortunately, is a bit of a wasteland when it comes to competition type activities with your dog. We have no lure coursing organizations. Rally obedience is just barely beginning to catch on here and events are few and far away. There is little in the way of organized agility. We do have a fairly robust flyball group but I couldn’t see Bettina doing that. After much research on the internet trying to find a lure coursing group that was within 2 days travel time, I stumbled across Granite State Greyhounds. This club conducts amateur straight racing under the auspices of the Large Gazehound Racing Association. I had heard of straight racing, but really had no idea what to expect. Still, hoping I could find Bettina an outlet before she found one for herself that I didn’t care for, I made contact with the group. The race meets were held at a location that was about 2 hours from our house. At the end of March, on a Saturday that started out with a little snow and ended with a sunny and warm afternoon, Blue, Bettina and I got up far too early in the morning and headed south. We had no trouble finding the field and proceeded to muddle our way through our first race meet. There were a lot of different sight hounds there to race and almost all the people I met were incredibly welcoming and kind to us newbies. 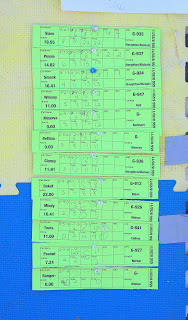 The Race Secretary was wonderfully patient as we tried to figure out where to go and what to do. I’m sure many people found us very amusing. We showed up with a racing muzzle about 3 sizes too big for Bettina. Of course I had not noticed that before I proudly presented our racing muzzle for inspection. We also had no racing coats. The kids had on one of their many dress martingale collars since we wanted to make a good impression. 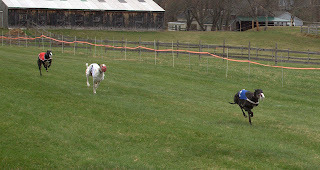 At the end of one of the races, I grabbed Bettina by the collar and she managed to slip out of it. She wasn’t going anywhere but back on top of that lure, but I ended up tackling her just to be safe. Someone came to our rescue by retrieving Bettina’s collar which I had dropped in the tackling process. I was flat on my back with a 60 pound dervish on top of me and thus in no position to do this myself. It was around that time that I was informed that those “fancy collars” were frowned upon in this venue. With a muzzle and coat on loan from the club, we managed to stumble our way through a full day of racing. I went there with no real expectations for Bettina’s performance. She is, certainly, not in top racing condition and we were just coming off a full winter of little to no activity. Yet as the day wore on and Bettina raced pretty well, I admit I began to harbor some small hopes for her ranking and I began coveting one of those massive fancy ribbons that they were awarding at the end of the day. I may have become a teensy weensy bit caught up in the competitiveness of it all as well, but I did manage to avoid excessive displays of joy or poor sportsmanship. 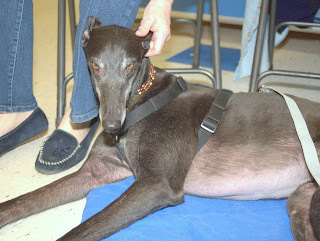 In the end, Bettina placed 6th out of a field of 12 greyhounds. Bettina could certainly care less where she placed. She just wanted to get back in that box and chase that lure again. And again. And again. Blue, having been judged too old to race peed in my car to express his disgust with this determination. But at the very end of the day they did give him a practice run on his own. My old man still has it in him and he’s in pretty good shape for an 8 year old. He gave that lure a run for its money. 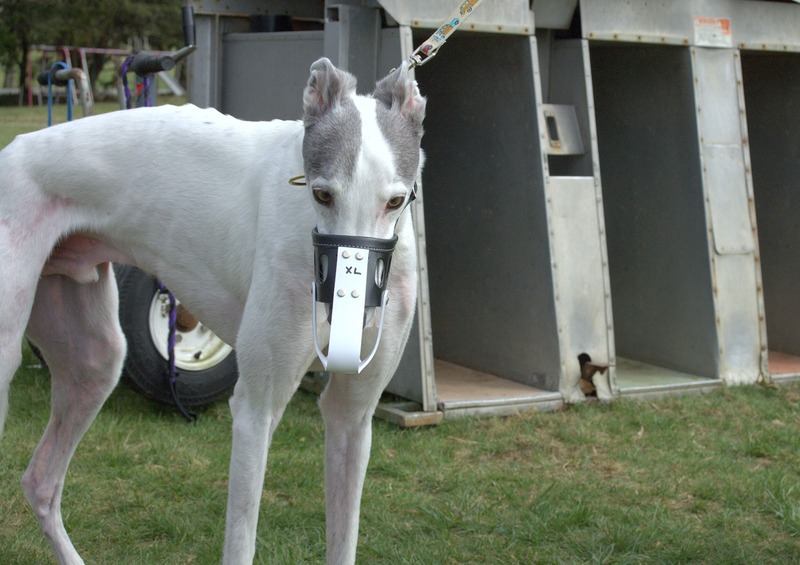 After our triumphant day at the races, we came right home and mumma ordered Bettina a proper fitting racing muzzle. I ordered one for Blue as well to perpetuate his (and my) illusion that he’s not getting older. I tried to find some racing coats to order. There weren’t a lot of places to get them and we were looking at paying between $60-$100 for a full set of 4. Mumma thinks she may have a go at sewing Bettina her racing coats. Luckily, Miss Bean can’t complain about having something homemade and really wanting something store bought to impress all her friends. Now if I can just keep myself from becoming one of those overbearing stage mummas…Tally Ho! WWDSD (What Would Dr. Spock Do)? We’ve all seen them. Some of us may even have had one. That kid on the floor in a store throwing a screaming mimi fit because something didn’t go his or her way. I admit to feeling smugly superior to those parents because I chose not to have any human children and thus would not suffer such embarrassments. Dogs would NEVER behave in that way. But I have been brought low for my hubris. Not long ago, I took Blue and Bettina to our local Petco. We’re in the early stages of spring here in Maine and cabin fever has definitely set in for both hounds. An unscheduled jaunt to the local doggy store for treats and attention seemed like it might release some of the pressure building up in Bettina, the little steam engine that could drive you nuts. Blue and Bettina sniffed all the pee-mail on the way into the store and left a couple of messages of their own. We went into the store and were, as usual, immediately accosted by customers, children and employees who happened to be loitering near the front. Something about the world loves a greyhound. And at least for my two, they seem to love the world. Our usual plan is to make a big circuit of the store. We mosey down the left hand side of the store, stopping to browse in the fish department and look at the dog books. Then we wander down the treat aisle at the back of the store. We round that out by sauntering up the right hand side of the store, browsing at the toys and rawhides. We reach the front of the store and must spend some time in the rodent section so Bettina can be obsessed with the ferrets, mice, rats, hamsters, guinea pigs and any other manner of small chewing creature on display. ﻿ All the staff at our Petco seems to know and remember Blue and Bettina. Some people I swear I’ve never seen before come running up shouting their names and dropping to the floor for hugs and leans. At the cash register, Blue, Bettina or Blue and Bettina will head around to the back side of the counter to assist the cashier in the checkout process and maneuver their little noggins ever closer to the bucket of treats that sits recessed in every checkout counter. Usually they get multiple handouts from this magic, never ending bucket. And believe me, they work it so hard it must hurt later. This particular day, they had extracted treats from both cashiers working the checkout lines. There were several people in line behind us waiting to check out so I finished paying for the bag of goodies and turned to leave. Blue and Bettina stayed at the counter. This isn’t unusual since they aren’t stupid enough to let a good thing end if it doesn’t have to. Usually I call and they will reluctantly exit the store with me. I glanced back at the other people waiting to check out and gave them a weak smile. No one was impressed. Sweating a little more now, I started to tug on Bettina’s leash in earnest but she leaned back and twisted her head away from me. Not wanting to appear to be abusing her, I got behind Bettina and scooched her forward. I managed to get her off to the side slightly so the next person could glare at me and check out at the same time. Bettina, upon figuring out where all this scooching was leading to, quickly turned right and ran behind one of the checkout counters (at least as far as her leash would allow). Now that I wasn’t holding up the checkout line any longer, the people in line started to view my predicament as less of an annoyance and more of an amusement. I had completely lost my head and I was begging and pleading with a greyhound to please be a good girl and we had to leave but I swore on my own life that we’d come back to the doggy store again. Nope. Nothing doing. It was then that I had a moment of clarity. I suddenly saw Bettina as the screaming bratty little toddler that she was being and I realized that I WAS one of those parents that I had so disdained. Worse, I could see that same thought in the eyes of all the other people waiting to check out as they watched me fail miserably to control a 60 pound dog. What would Dr. Spock do in this same situation? Honestly, I didn’t give a full poopy bag what Dr. Spock would have done. I bent down, hoisted a struggling hound into my arms and made an extremely ungraceful exit from Petco, dragging poor Blue along behind me and dropping my car keys a couple times just for good measure.